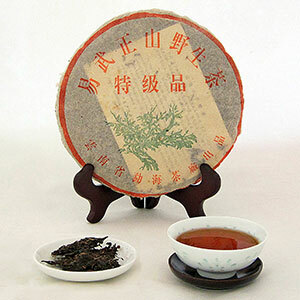 The Green Big Tree is a famous batch of tea cakes manufactured by the Menghai Tea Factory during the late 90’s. Aged in Hong Kong, this cake is a product of dry storage. Brewed to an amber hue, the tea broth is dense and bright. The aroma is sweet with a layer of floral scent. The astringency is almost gone after 15-plus years of aging. Instead, the tea is smooth and offers a sweet camphor and honey flavor. What is most impressive about this tea is the immediate and long "hui gan" (the cooling aftertaste). The mouthfeel is just incredible. This tea is well on its way to becoming a great vintage tea. It is with no surprise that this tea can only be accessed from the hands of collectors. We are very proud to offer a tea of such caliber. Use 5g of leaves per 5 oz of water. Rinse with 212 degree F /100 degrees C water prior to brewing. Follow the suggested steeping times below.